Born and raised 1979 in Bayreuth, Ben Brix lives in Berlin working as videoartist, cinematographer, camera man and media technician. © Benjamin Brix From sculpting which he has been doing since 2001 in Berlin, he began to study product design in 2005 at the art school in Kassel. 2008 he changed to the class of virtual realities of Bjørn Melhus and started to study video art. In 2009 he studied for one year at the Academy of Fine Arts in Vienna in the class of Constanze Rhum. 2013 he finished his studies in Kassel and moved back to Berlin. His final work was shown in Prag from the Start Point Price. Since then he has worked as DOP for several artists and filmmakers, such as Bjørn Melhus, Marco Brambilla, Hiwa K, Theo Eshetu and many more. 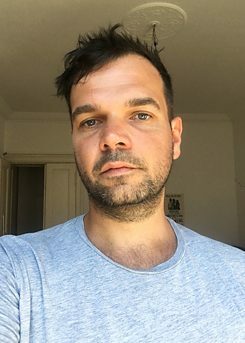 Since 2010, he has also worked as video artist for several theatre productions of Felix M. Ott, creating the visuals shown on stage to support the piece. A short film “Emptylands” that he created with Felix M. Ott and Steffen Martin was also the base to a piece of Felix M. Ott, and also won the “Goldener Herkules” prize in Kassel in 2013. Since 2012 his artistic work deals with the observation and use of moving image to fathom out the area between pure documentation and fiction.The credibility of images and how they create meaning is a central topic of his work. 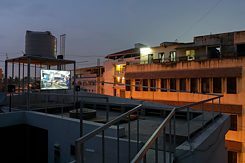 During my bangaloREsidency in 2018, I was very interested in the Chickpete neighbourhood in Bangalore. It is the largest market quarter of the city. The sellers settle depending on the product sold in particular streets. It seems to be a kind of unwritten law, that for example sellers of electronic equipment open their shops in a certain area and one street further are only sellers of metal or fabrics. In the globalised economy that is known from Europe, it's difficult to understand where the products you can buy come from. Even food is often shipped around half the globe before it gets sold in a European supermarket. In India, however, many products come not only from the country but also from the immediate surroundings of the respective city. After spending a lot of time in the markets in Chickpete I wanted to find out where different products come from every day. One place that impressed me was the flower market. It's open almost 24 hours every day and the amount of flowers sold there every day is really huge. Flowers are very important in India as they are used in a religious context to worship by decorating temples for example. Other products that I found interesting were fish and silk. In Chickpete there is a fish market next to the flower market which is also open every day. Since Bangalore is in Central India and not close to any coast, most of the fish comes from Mangalore, a smaller town on the Indian Ocean. There's also a whole neighbourhood in Chickpete that weaves fabrics with old electric looms. The fabrics are often made of silk that is produced in the surrounding areas of ​​Bangalore. My idea was not to create a documentary work. I wanted to observe without judging or explaining. That's how I started filming in the markets and often followed sellers through the streets. Fortunately, I was mostly accompanied by an Indian friend, Nikhil Nagaraj, who also did the sound recordings for my work. He speaks the language and helped me to communicate with the local people. So we gradually found out where the products sold in the market are produced. First, we visited a village about 20 km from Bangalore. The people there specialise in the production of silk. We were allowed to film how the caterpillars spun the cocoons and how they were cooked to unwind the thread with which they had been spun. Another village that we visited later housed many flower farmers whom we could film in the greenhouses. For the presentation, I made a 12-minute long excerpt of the material and displayed it in Bangalore on a flat screen.